The 26th Annual Meeting of the Asia-Pacific Parliamentary Forum (APPF-26) will build on the success of the 25th APEC Economic Leaders’ Meeting, further advancing the Vietnam National Assembly’s standing in the international arena. Vietnam’s hosting of the 26th Annual Meeting of the Asia-Pacific Parliamentary Forum (APPF-26) marks an important external political event, kick-starting a host of diplomatic activities across Vietnam in 2018. The APPF-26 meeting takes place as the Asia-Pacific Parliamentary Forum marks 25 years of establishment and development, representing a new landmark in the history of the APPF, which creates the imperative for a renewed agenda and the outline of a new vision for the APPF over the next stage of development. To date, more than 20 member parliaments have confirmed their participation in the APPF-26 event which is set to transpire from January 18-21 in Hanoi. This is the second time Vietnam has hosted the APPF’s annual meeting, having organized the 13th edition in Ha Long city, northern coastal Quang Ninh province, in January 2005. At this meeting, Vietnam proposed an initiative on cooperation to alleviate the effects of earthquakes and tsunamis, which received approval from participating countries. The APPF-26 holds great significance and is a practical action of APPF members in support of the Da Nang Declaration on Creating New Dynamism, Fostering a Shared Future, which was adopted by the 25th APEC Economic Leaders' Meeting in Da Nang in November of last year. The meeting is also designed to promote the role of member parliaments in APEC cooperation, bringing into play the accomplishments of 2017 APEC Economic Leaders’ Week. The APPF and APEC will continue to further the role of the Asia-Pacific region as a driver of global economic growth and connectivity. Six APPF-26 draft resolutions have also been drawn up, focusing on the APPF’s role in cultivating partnerships for sustainable and inclusive growth in Asia-Pacific, improving cultural-tourism cooperation in the region, and intensifying joint action on adapting to climate change. They also address food security – sustainable farming, the role of parliament in promoting extensive and inclusive economic connectivity in the region, and the optimization of parliamentary diplomacy for regional and global peace, security, and prosperity. Food security and sustainable agricultural development, are up for discussion at the APPF-26, having been an issue of major concern at the recent APEC Economic Leaders’ Meeting. Such challenges affirm the important role played by member parliaments in accelerating the implementation of sustainable development goals, including safeguarding food security through specific actions and solutions. As the APPF chair, Vietnam has proposed a theme of “Parliamentary partnership for peace, innovation and sustainable development” for the APPF-26, reflecting the direction of development in international parliamentary diplomacy, especially at multilateral forums. The theme also focusses on the plenary sessions of the meeting which will issue a joint declaration reaffirming member parliaments’ commitments to cooperation on economic, cultural, and regional development for peace, security, prosperity, and sustainable and inclusive growth. 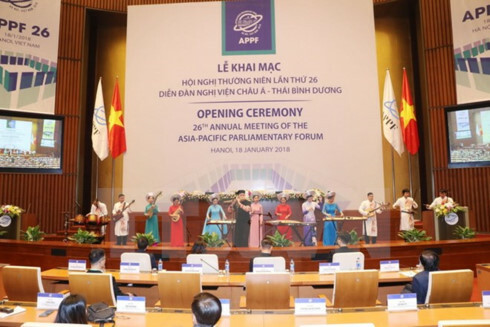 The National Assembly of Vietnam has proposed the draft APPF Hanoi Declaration - a new vision for the Asia-Pacific Parliamentary Partnership to ensure the legacy of APEC and conform to landmark declarations adopted by the APPF. The APPF-26 is expected to welcome delegates from numerous major countries, each with an important role and voice in international relations. Therefore, the hosting of the APPF-26 will contribute to raising the profile of the National Assembly and Vietnam alike as it builds upon the successes of last November’s 2017 APEC Economic Leaders’ Meeting held in the central city of Da Nang.